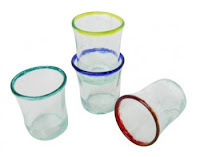 These colorful recycled glass shot glasses are a contemporary take on traditional shot glasses. Made from recycled juice and mixer bottles by Who's Glass? in Devon, UK, they'd probably be perfect for drinking sake from as well. 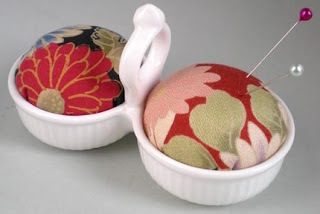 These adorable pincushions are handmade by Japan-based Tago Design from vintage Kimono fabric. Measures W10 x D5 x H6 cm (3.9 x 2 x 2.3 inches). 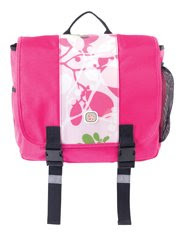 Part backpack, part messenger bag, you could say this bag is perfect for kids on the go. Not only is it made from eco-friendly materials, it's also lead free, teflon free, PVC free, and has removable straps. Ages 5 to 10 years old. Available in Pink Ogo, Chocolate Tangerine Ogo, and Black Pirate Camo. Measures 10”H x 12"W x 4”D , Lunch tote - 9"H x 6.5"W x 3.5"D.